Equipping sports officials to effectively fulfill today’s expectations requires fresh thinking. The 2019 Sports Officiating Summit will provide officiating leaders an information driven educational program grounded in proven techniques — techniques that perform in our fast-paced, mobile, short-attention span world, and will focus on issues and discussions related to the how, what and why of training programs for sports officials nationwide. With the hard work and ingenuity that officials have always displayed,we’re sure to identify best practices and construct plans that can be put to work immediately. register before May 15, you’ll get the lowest possible pricing for yourself or your group. Learn more about pricing and the program at sportsofficiatingsummit.com. One of the major highlights of the recently completed NASO Summit in New Orleans was a Grand Prize Giveaway raffle that was held after Fox Sports rules analyst Mike Pereira’s talk at the end of Officiate Louisiana Day. Anyone who signed up for NASO membership or renewed that day was entered. The winner earned a dinner with an NFL crew, two tickets to an August New Orleans Saints’ preseason game and a Marriott hotel stay. “My family and I would like to start off by saying, ‘THANK YOU, THANK YOU, THANK YOU’ to you and the entire staff at NASO for this weekend experience,” he wrote. “We started off with a terrific dinner at the Bourbon House restaurant where we were treated to a wonderful meal. Meeting four of the seven referees that were going to do the game was a great time as well. Barker also praised referee Clete Blakeman for a last-second save on the game tickets. There were two tickets as part of the package, so Barker’s wife Stacey was going to defer and let him take their 14-year-old son Brody to the game instead. “… When Clete heard that she wasn’t going to the game, he arranged for us to get some of the tickets they were allotted so we could all attend,” continued Barker. “That made my wife’s night knowing that all three of us were going to be able to attend the game. In a follow-up phone call, Barker said the event was a great idea by NASO (he has been a member for about 12 years) and that it was fun to be a part of Officiate Louisiana Day. Barker got into officiating largely because of his father, who founded a city recreation league and then worked in it for many years. “Then someone came up to me and said, ‘You should be an official,’” he said. “I had a friend involved too, so I said, ‘Yes.’ It’s the same story as a lot of these guys. You play the sport you love and then you retire but you’d like to stay involved. Barker said he’s clearly going to seriously think about coming to future NASO Summits. “I definitely want to check out what they do at other events, in other cities,” he said. The 36th annual NASO Summit concluded in New Orleans at the end of July. Sports officiating leaders from across the United States and Canada attended. We caught up with three state leaders to see what they thought about the Summit in general, how the sessions impacted them and what they brought back to their membership: Dana Pappas, commissioner of officials/deputy director of the New Mexico Activities Association; Jason Nickleby, Minnesota State High School League (MSHSL) director of officials; and Mike Fitch, executive director of the Texas Association of Sports Officials. What was most unique to you about this year’s Summit? Pappas: Each Summit has its own different “flavor,” with this year being no different in that regard. This was the 15th consecutive Summit I have attended and each year has its own unique feel to it. The fact that the Louisiana High School Officials Association hosted their Officiate Louisiana Day themselves showed how much pride individuals have in officiating and how important and special high school officials are. The talk that we aren’t “just” high school officials was prevalent throughout the Summit. The celebration of officials each year at the Gala is so special because we, as a community, need to always ensure that we recognize and value our officials. The camaraderie among the attendees is special each year. There is nothing else like it and there is no better place for people from our industry to learn from one another, to celebrate each other, to problem solve and to set goals for ourselves as individuals and state associations. Nickleby: Compared to other Summits, this one had unique and additional engagement for attendees. Panel and individual speakers were great, however there was more involvement for the audience, and that was a plus. The “live” vote on plays and the breakouts to provide feedback engaged attendees, making the Summit more effective and it worked out really well. Fitch: All associations face the same problems, and we’re trying to solve them similarly, but we’re not all the same. I like what Michigan is doing — giving out postcards to coaches to use them to get in touch with high school kids. We will add that to our STaRT (Students Today are Referees Tomorrow) program. Working with B2B (Battlefields to Ballfields) is good for all us — military veterans, associations and the schools. Many states have similar problems and solutions, but we need to fine-tune programs to local circumstances. What message did you bring back to your state association? the many positive things that come from officiating — the friendships, the road trips, the unique service officials provide to kids (at the state association level), having the best seat in the house for games, staying active in sports we love. Each summer, the Summit is the recharge that administrators need to ready their officials for another season. This year’s Summit gave the same rejuvenation to all who attended. need to determine the route to do that and how to engage them in officiating opportunities in our state. Fitch: I liked the mentoring programs. We have 157 chapters throughout Texas that vary in size, from less than 20 to more than 1,000, which makes one model very difficult, so we will work on a statewide template they can modify. Let them know the things they can do, then let them decide. 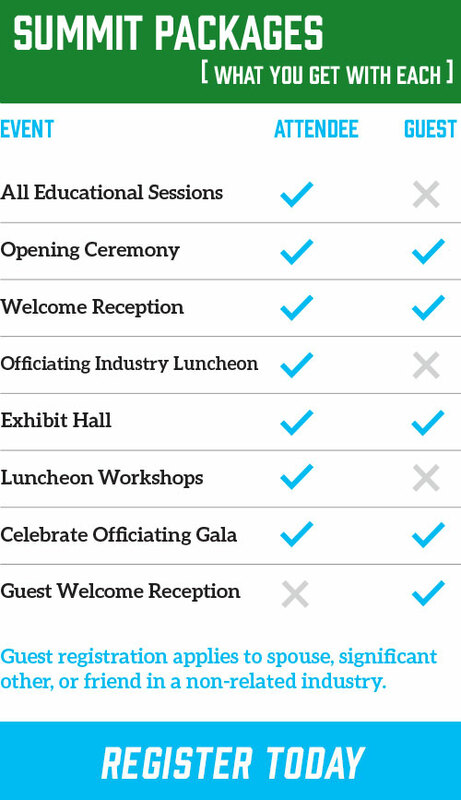 How will you be able to use your Summit experience to help “Say Yes to Officiating” in your state? Pappas: We are utilizing the “Say Yes to Officiating” hashtag for our recruitment and retention videos to our current officials, prospective officials and our member schools. We have asked our officials to send us 30-second videos of themselves explaining what their yes to officiating is — why they got started, why they continue to officiate, why they love it. We have encouraged them to incorporate their crews on road trips or to film themselves and their partners/ crews before or after contests. We need to all remember why this isf un. Attending this year’s Summit reminded me that the best way to tell the story of officiating isthrough our officials and the best representatives we have to “sell” this profession/avocation to others is by hearing from and seeing our officials enjoying the experience. Part of this process is the humanization of officials — showing “Joe Sports Fan” that officials are humans, who are enjoying what they do! Nickleby: There are some personal lessons I took away that I would extrapolate to the state level. Many people have said “yes” to me in my officiating career, and we need to encourage our veterans to say “yes” to other officials — both current and prospective. We need to increase our drive on mentorship, developing interpersonal relationships and game management skills. On a personal level, people have said “yes” to me, and I want to see officials at all levels of MSHSL programs start saying “yes” to others and keep this movement going. attend. Neither had been to a Summit before. They were skeptical beforehand, thinking it was mostly for and about professional sports officials, wondering if they’d learn anything. During breaks we would talk and you could feel their excitement through what they’d learned and the relationships they’d developed. Those are always positive things. The two people I brought the previous year had the same feelings. Next year, we’d like toexpand our sponsorship so we can send four people. NASO Summit attendees in New Orleans received a unique welcome this year, as NBA commentator Mike Breen welcomed attendees to the New Orleans venue July 29. Breen, to many unaware in the audience for the Opening Ceremony, was himself a basketball official for 10 years, having ascended to the junior college ranks. He used that as a springboard for his remarks. In his video presentation, Breen expressed his envy of the officials in the room, citing his previous experience 30 years ago as a basketball official. His love of officiating was manifested through the camaraderie with on-the-court partners who “have your back.” Breen highlighted that bond with partners as a great reason for others to consider taking up sports officiating. He also expressed the importance of rules knowledge and how that has helped make him a better sportscaster. “Knowledge of the rules gives you confidence on the court,” he said. He told the audience about the important responsibility they have as game officials, ensuring impartiality and rules enforcement equitably. “It’s never been more important or more difficult” to be be an official than it is today, he observed, citing outside pressures on rulings, and emphasizing the impact of social media. Officials are “under a microscope,” he said. “Mike brought extraordinary focus to the overall importance of what we do as officials. He brings an understanding of the importance of officiating to his very public role as an announcer,” Barry Mano, NASO president, observed. “There are very few people in a similar position as Mike who have his understanding and respect for officials and the officiating community. It’s why we asked him to address the Summit. For those who were not able to attend the latest Summit in New Orleans, you can experience some of what the attendees did by going to the NASO website. The Breen welcome video, shown at the Summit, is now available on the website. 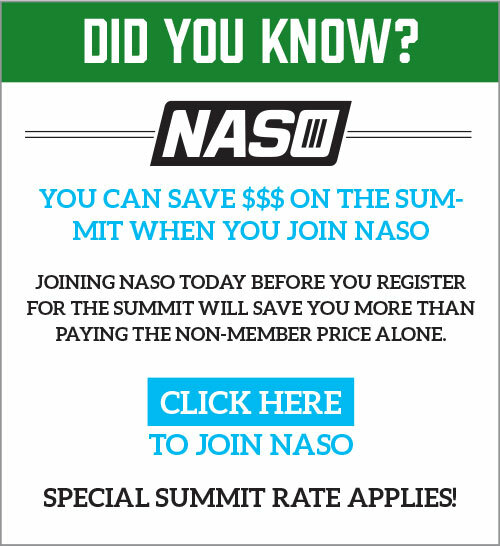 To watch the video and others connected to past Summit events, go to naso.org under What We Do, click on Sports Officiating Summit and then Past Summits. More than 350 people attended this year’s annual Celebrate Officiating Gala in New Orleans July 31 to wrap up the NASO Summit. Under the theme “Say Yes to Officiating,” those in attendance helped celebrate the best the officiating community has to offer during an elegant evening banquet, which included the presentation of the Gold Whistle, Mel Narol Medallion and Great Call awards. Keith Alexander, who served as a longtime Louisiana High School Activities Association assistant executive director, was the recipient of the Great Call Award. The award is presented to those who, through their actions, shine a positive light on officiating by demonstrating an honorable level of human quality that is normally out of public view. Bob Kanaby, retired executive director of the NFHS, was named the Mel Narol Medallion recipient. Kanaby is known for promoting the education of high school coaches and his ongoing mission of protecting and promoting a positive education-based culture in high school sports. The Medallion is awarded to an individual or organization that has made significant contributions to the betterment of NASO. The award is named after Narol, longtime officiating legal advocate and NASO leader. Kanaby added that officials provide a “public service” to the nation that is not always appreciated by the people they serve. 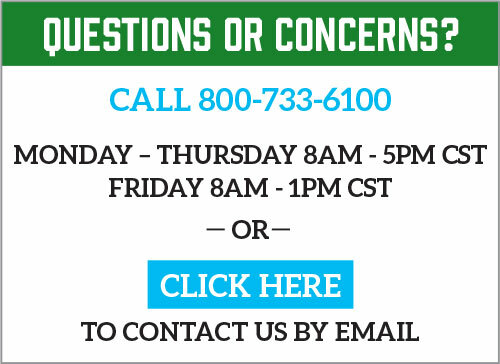 He acknowledged while there will be a difficult road ahead to recruit and retain new people to officiating, he believes people will respond to the call to action by state and local officiating associations. He implored the audience to always uphold the values associated with officiating. The biggest award of the night went to former NFL referee and current collegiate coordinator Bill Carollo. He was named the 2018 Gold Whistle Award recipient. An NFL official for 19 years, he officiated in two Super Bowls and served as the director of the NFL Referees Association from 2000-06. The award honors an individual or organization that has made significant contributions to the betterment of officiating. NASO President Barry Mano said Carollo was a deserving recipient of the award because he has helped many officials have successful careers on many levels. He now serves as the director of officiating for three NCAA Division I conferences and says the job allows him to continue to help new officials. 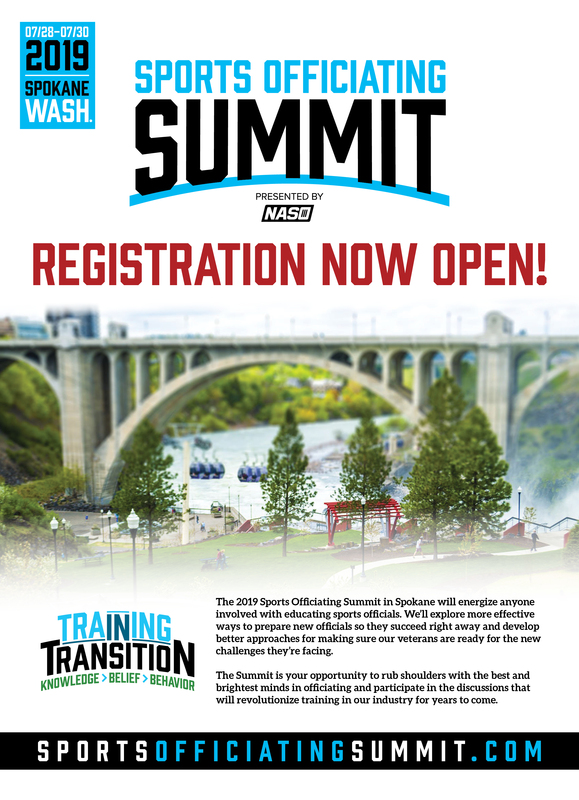 NASO’s 2019 Summit Will Be in Spokane, Wash. It is “especially vital” to be trained differently for the challenges in the years ahead given the growing responsibilities of sports officials in society today. To capture solutions to these challenges, next year’s theme for the NASO Sports Officiating Summit in Spokane, Wash., will be: Training in Transition: Knowledge, Belief, Behavior. “Given our job responsibilities, our visibility and what is expected of officials in terms of accountability, we need to be trained differently in the coming years,” said Barry Mano, NASO president. That focus will encompass societal changes. With increasing demands being placed on officials, how do we keep up? What new skills are necessary? How does digital technology play an increasing role? “In our culture, there’s a churn to get around rules and regulations. Officials must have more reverence for the rules while everyone else has less reverence. We must get evangelical about this — that’s part of the transition. The Summit will be a fresh way to look at officiating and our impact on the game and our role in society,” Mano said. In the past, there’s been a general theory that officiating is 80 percent rules knowledge and 20 percent game management. Training in Transition will focus on the game management side. “Officials must get really good at game management. That 80-20 model may now say 80 percent of our success will come from game management and how we comport ourselves,” Mano said. With the wheel “grinding” on officials more and more, according to Mano, the specifics for next year’s Summit were not driven so much by the need to be more informed on the rules: “We know the rules pretty damn well,” he said. “The conduct of players, coaches and officials is becoming increasingly important.” The Summit will address issues related to the increasing scrutiny placed on officials as more and more digital imaging makes its way into the public sphere. “How we deal with captured images today can reveal how good or bad we are as officials. It’s another skill we have to learn today. We must ingest information about our performance. It’s all part of the training regime,” he added. Next year, the state sponsor is the Washington Officials Association (WOA). “People are going to love Spokane. It’s a really nice town,” Mano said about the 2019 Summit location. Why Washington? State associations come to NASO to express their interest and NASO takes that into consideration as future Summits are planned. “We go where people want us,” Mano explained. Todd Stordahl, WOA executive director, said Washington missing out on the Summit when it went to Portland, Ore. (2012), motivated him and the association to find the additional hotel space at an affordable price to make the Summit happen in the state. With the ability to enhance its partnership with NASO and the changing focus of WOA (the association will have 100 percent participation by its 5,000 members in NASO for two years when the Summit arrives next year), Stordahl believes this will be a great opportunity to highlight the successful and growing relationship. Dean Corcoran, WOA board president, agreed that the association wants a good showing from its membership. Stordahl also expects a good number of members to stay for the Summit after the state day. When Mano visited to check on locations, the hotel wasn’t built yet. The 2018 NASO Summit will feature speakers, sessions and workshops that cover a variety of officiating topics from sports at all levels, all aiming to further the Summit’s motto of “Say Yes to Officiating.” Be sure to check out “Skills for a Lifetime” on Tuesday, July 31, a session that will celebrate the positive elements of officiating that stay with officials even after they step off the field. Speakers at this session include Dee Kantner, an NCAA Division I women’s basketball official and the WNBA director of officials, NCAA football referee Mike Defee, and former MLB umpire Dale Scott. Scott, who retired last year after three decades in the majors, recalls the biggest moments of his career and how he handled the difficult decisions. In Game 3 of the 2001 World Series, Scott called a foul ball on a dropped pop fly with two outs and runners on base, a play that the players believed to be a fair ball. After a discussion with both players and managers, the air was finally cleared: Scott got it right. Off the field, Scott also celebrated the bonds that he forged with his fellow officials. Of course, not every call will come with the same personal satisfaction, and Scott learned how to cope with those as well. “Every game and situation in my career was different. You always run into something new,” Scott said. “I loved the challenge that came with that because it meant I could always get better. The 2018 NASO Summit App is now available for download on your Android or Apple device. Use it to explore the schedule, locate events on the hotel map and search the program details. The app will also give you easy access to the interactive features for Monday’s “You Get to Call It” session. **Make sure you “Accept Notifications” so you don’t miss out on any details.